Diwali is an auspicious day for stock market investment. On this Diwali, you might be wondering in which stock you should park your money to generate a superior return. 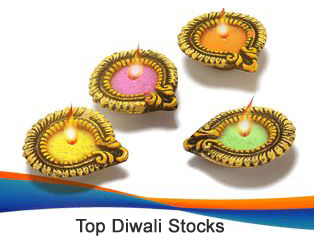 To help you out here is Top 7 Diwali Stocks to sparkle your portfolio. Prior to sharing details about these stocks let’s try to look at a stock market performance this year. Last year was a bearish year for the stock market – China Yuan devaluation, Weak rupee, Bihar election outcome, global economy are some factors that were affecting the stock market. In the past one year, benchmark index Sensex plunged over 4.1%. The nifty index was down by 2.9%. Only few midcap stocks could perform well in last year. If we compare the performance of Sensex over the past 5 Diwali, Sensex was consistently giving positive returns since past three Diwali. From above nothing is coming out clearly, however, Markets experts believe that investors would be bullish in the Samvat 2072. Sensex may touch a level of 30000 giving 12%-18% gain from the current level. 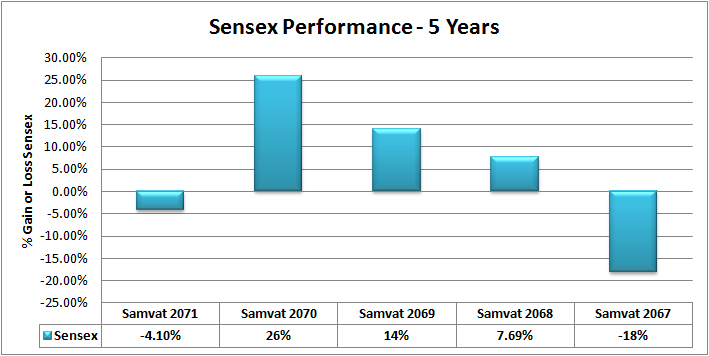 Stock market experts have tried to identify top 7 Diwali stocks that can generate very good returns in Samvat 2072. Prabhudas Lilladher expects Infosys to sparkle this year. Multiple strategic initiatives planned by management like zero bench, zero distance, client mining will pay a crucial role in profitability and growth of the company. The target price for Infosys is Rs 1440. JK Laxmi cement is next stock pick by Prabhudas Lilladher. JK Laxmi cement is one of the largest cement producers in India. JK Laxmi holds around 7% market share in the cement sector. This company is maintaining most efficient operations and increasing capacity. Target price set for JK Laxmi Cement is Rs. 440. Bajaj Finance is recommended stock by ShareKhan. The brokerage house believes Bajaj Finance is the best play on India’s consumption theme and mortgage market. Bajaj Finance’s business model and strong earnings performance are other positive aspects of Bajaj Finance. Britannia is another stock recommended by Sharekhan. Britannia is a second largest player in Indian biscuit market. Britannia is continuously enhancing its product portfolio and expected to sustain double-digit growth in future. ICICI direct have a positive stance on ITC given its focus shifting on growing FMCG business with the target to achieve Rs 1 lakh crore revenues by 2030, which translates into a 17 per cent CAGR growth. PNC Infratech is next in the list of ICICI direct.PNC has a very good track record of timely completion of projects. PNC is sitting on very good order book worth 4000 Cr. Strong order flow in pipeline and growths in the industry are positive points about PNC Infratech. HDFC Bank is recommended stock by Reliance Securities. HDFC is second largest private sector bank in India. The bank has consistently outperformed its peers on both financial and operational fronts led by the strong liability franchise, low exposure to stressed sectors and superior risk management practices. Reliance Securities maintain a buy rating on the stock with target price of Rs 1193. Hope Investments in these stocks will grow and give magnificent returns by next Diwali. « Gold Schemes by Government – Good for Investment?